QingDao LONPEN Technology Co.,Ltd is a high technology company who is specialized for designing,producing and selling of vending machine products which was founded in 2006 . All the engineers have at least 10 years experience in vending machine line. The vending machine product is of high and stable quality which is beloved by all customers. Now the major products are hot nuts vending machine, hot nuts dispenser,egg vending machine and snack vending machine etc and the annual production capacity is more than 4000 units. 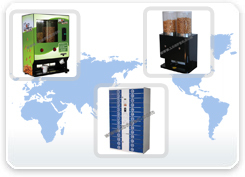 Now the hot nuts vending machine, hot nuts dispenser,egg vending machine and snack vending machine mainly export to Australia , UK , New Zealand , USA , Russia , Germany , Ireland , Holland , Singapore and The Middle East etc . The SMS wireless internet management system which is designed and researched by our company is also used for these machines now. At the same time, we are now also developing other vending machines according to customer requirements so that we can enlarge our product series and you can sell more products with our vending machine. QingDao LONPEN Technology Co.,Ltd will always insist on the company vision of “Quality first, Customer supremacy ” and will push the development of the vending machine business actively and will supply customer high quality products and excellent service.